Recently, I acquired an old Specialized Stumpjumper through the classified pages of Craiglist. As the first production mountain bike in the world, the venerable Stumpy is the stuff of legends, and a bike I’ve long coveted. Although 20 years of accrued excitement is a lot of hype to live up to, it was everything I’d hoped for, and it inspired me to expand a brief blog post into a short column for the Singletrack – an independent mountain bike magazine in the UK. As usual, I exceeded my word limit, so space constraints demanded that it be trimmed back for print. This is the full version. Almost 30 years old, my ’84 Stumpjumper has become my day to day ride. A history lesson with every pedal stroke. Days of Klunker, published in Singletrack, Issue 80. Urban Dictionary definition of Klunker: An automobile, or occasionally another object, that is in poor condition due to mechanical problems, age, damage or other issues. The bike in question was sold to me by Val, whose gentle manner, fist length beard, and well worn Paul Components cycling cap made him a reassuring seller. A short spin round the block revealed a wonderfully smooth ride that belied three decades of existence, and certainly seemed worth every cent of the $200 price tag we’d settle upon. 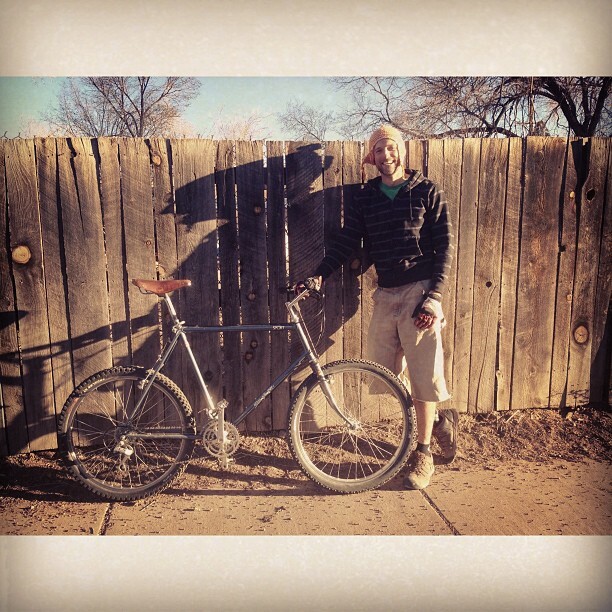 I’d always harboured a craving for a vintage American MTB, and a recent move to New Mexico, USA, had revealed a slew of opportunities via the treasure trove of Craigslist. Indeed, only a few months of web scouring had passed before the appearance of a gate-like, 22in Specialized Stumpjumper Sport – perfectly suited to my own lanky frame – urging me to take on its stewardship. Quite apart from nostalgia, the idea of possessing a piece of history that was affordable and relevant to me definitely appealed. As did the sleuth work that was required to unearth a fragment of its story. As much as I could tell, it was probably fabricated in 1984 (I’d have been 10, and riding my flame red Raleigh Grifter Mk2 at the time). With its fancy lugs and dual crown fork, it was identical to the iconic Stumpjumper launched in 1981, the very first mass produced mountain bike the world had seen. In any case, its patina suggested it had been well cared for; the shop sticker indicated its journey began in Tucson, Arizona, a swathe of desert so dry the US Air Force mothballs its planes there. Original decals still adorned the Chrome-Moly tubeset – Special Series Touring – in banded yellow, orange and red. Wiping away ingrained dirt like an archeologist revealed cranks stamped with tell-tale markings – FT MC60. These allowed Andy, my go-to expert, to date them back to 1989. “While your Stumpjumper has features that are a mix between the paleolithic klunkers of the ’70s and the neolithic mountain bikes of the late ’80s, it leans toward the klunker side of things as far as expected performance goes,” he observed with a professorial nod. Likewise, neither the Deore 7 speed freewheel nor front and rear mechs were original – not that I cared. Every change was part of its story. And besides, they worked. Ke-klunk. Aptly, that’s the sound of a Deore II friction shifter pushing a 7 speed chain into gear. No hint of mechanical problems there. Its shiny, triangular bullmoose handlebars were original, and the elegant, high flange Shimano hubs (a few more swipes of the archeologist’s brush: MB MN72) were likely specced at the time. Gorgeous they were too, complete with cigarette-thin axles bodies and elegant, cut out windows. To these, were laced to wideset Araya rims: Made In Japan, 36 holes a piece. Back then, 32 spoke wheelsets were the domain of racing, not that too much of it existed. The majority of bikes were for exploration. With or without panniers. Pushing up a hill if need be. The pushing part was clear from the geometry: endlessly long chainstays and angles so slack the bike seemed to be falling backwards. 70.3 and 68 degrees were the go-to numbers of the time (by the late 1980s, more contemporary 73 degree seat and 71 degree head angles had largely taken over). But what does that mean? Good for descents, not so great for climbing, which would account for the peculiar noodliness I noticed when honking out the saddle. Historically, the geometry reflects the era. Again, I wasn’t so worried. After all, walking up a hill is a just chance to take a breather, or chat with friends. With so much mountain biking heritage to its name, imagined eyebrows raised as I cruised around town. In any case Dave, owner of Mellow Velo, my local bike shop, positively glowed when I rode over. He promised to teach me the dark art of adjusting cantilevers, as up until then, grabbing a handful of brake (literally, as the levers are enormous), didn’t completely guarantee the promise of stopping. Not that I’d originally intended to really push Stumpy beyond city duties – I’d bought the bike mainly for forays around town. But old bikes have a way of stirring up restless feelings. Only a few days had passed before its wheels were shod the fattest set of 26in knobblies I could find, previously accumulating cobwebs in the yard since my acquisition of a 29er. After all, a bike with this kind of pedigree needs to be really ridden, I figured. It would be an injustice to do otherwise, I reasoned. Its day of re-initiation involved a climb up Forest Road 89 – an old rough and tumble jeep track that winds steeply up into the mountains behind town – followed by a plummet down loose and rubbly singletrack; rocks, steps, slabs and all. Let loose. No holds barred. And, despite a broken chain, a few mistimed turns and a loosening headset (all part of the Klunker Experience, so I’m told), I thoroughly enjoyed it. The ride was noticeably different from that of its modern cousin, my rigid 29er, but in its own way, no less entertaining. Perhaps it was the sense of history imbued within the bike. Maybe it was the romanticised imagery of jeans-clad mtb pioneers, hurtling recklessly down Mount Tam, California (foot down, plumes of dust in their wake). Most likely, it’s because there’s good reason this was the very bike that inspired a generation of riders to get out – and begin discovery of their local trails. 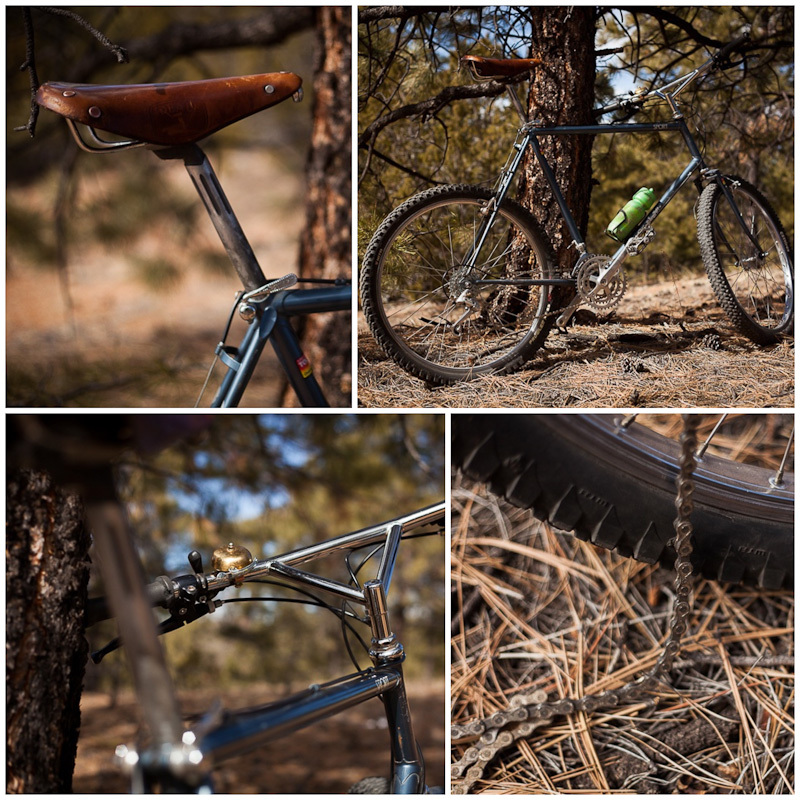 A lugged frame, a twin plate fork crown crown, bullmoose bars and an Ideale saddle – just some of the details on my new/old Stumpy. Thank you Andy, aka Big Dummy Daddy, for 80s mountain bike technical advice, and a thoroughly entertaining fat tyre history lesson. I have (had) a ’90 alum frame Mongoose Alta that I stripped to nothing and single-speeded and stuck some 6” rise comfort bike handlebars on, some streetfighter tires and called it my “urban basher.” I’m looking at it now here in the Blonde’s backyard where it lives since being donated to her son as a reward for getting his first job. “…angles so slack the bike seemed to be falling backwards…” I may have to steal that one sometime. Thanks TJ. Passing on these bikes from person to person is a fascinating part of their journey. I’m aware of an Mongoose Alta that’s now lives on the coast of Honduras. Perhaps a little docket should be furled into the handlebar, like a message in a bottle drifting out to sea. I don’t mean to be picky, because I’m really not that guy (the internet know-it-all-but-actually-nothing-looser), or at least I hope not to be. But the bar/stem combo is Bullmoose not bullhorn. The latter being fixie famous, the former being magical. Your bike looks like a tractor. I like it. Oh yeah! That was my first mountain bike. 1983. 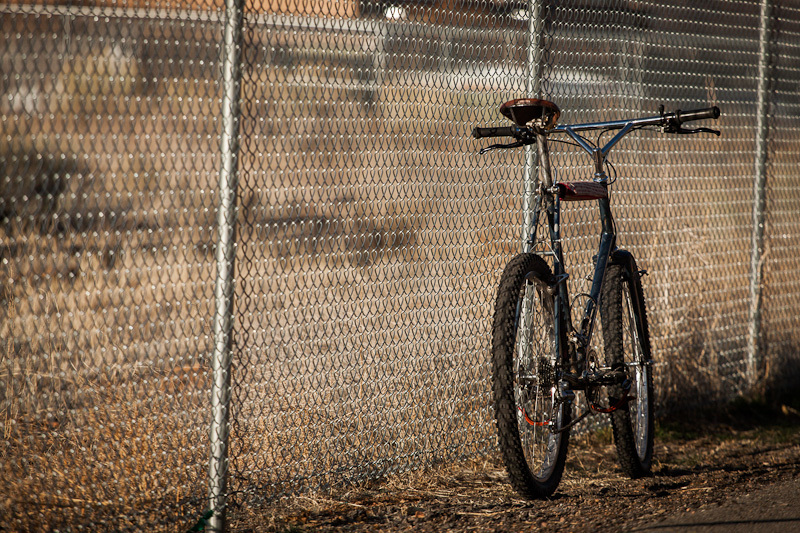 Stumpjumper Sport in silver. I have a pic or two of me riding in on my personal blog. http://www.fastmtnbiker33w.wordpress.com. It was priced at $550 in my local shop. I traded a pretty much new Hutch BMX bike for it. Everyone thought I was crazy. I got to ride it in the Smokey Mountain National Park before bikes were illegal. I went to Nantahala and there was one in the rack outside the shop and another one in the window of the shop. It eventually broke and Specialized warrantied it with a ’90’s model Rockhopper frame which of course none/few of the components fit on. Both of my parents still have the Stumpjumper Pro (identical to the one on display in the Smithsonian. My mom’s is mint except for an index shifter/derailleur combo I installed on it back in the late 80’s. Both of their bikes still have the Tomesselli motorcycle brake levers. Enjoy that bike and don’t break it! Thanks for the story; I love the idea of entering a new and unchartered world of fat tyres and dirt road riding. I was just in Black Mountain Cycles, Marin, and spotted an old Stumpy with the motorcycle brake levers. Wow, great story. It brought back wonderful memories of my old Rockhoppers. Here is a link to a little story I did with a similar history theme. Thanks for the link Jeff. Love the photo of you and Travis! So strange that you would post this today. YESTERDAY I retired my Stumpjumper as the daily commuter. Today was my first day on a new machine. My Stumpy (still my camping/loaded touring rig) is an 89 Comp, so welded fork and frame and more modern angles for sure. Both original XT derailuers are still on there, and the Specialized branded headset has been repacked a few times but it’s original but nothing else is. I stripped my paint once it got bad enough and had it powder coated, spread the dropouts to accept a 135mm spacing and turned into a balloon tire 9spd drop-bar conversion. After adding the fattest fenders I could find it became a perfect Seattle rainy day commuter, still solid after years of abuse! The canti brakes always sucked though. Sounds great. Modernising old steeds makes a lot of sense to me. Balloon tyres rock. Thanks for the account! Wow! I feel famous. Congrats on the nice write-up. I look forward to seeing what sort of exploration you do on your Stumpy. It looks perfectly suited to the New Mexican landscape. I am in the process of moving and have my specialized that I bought in 1983 new when I went off to school in Chico. The handlebars and seat have been changed but otherwise original. D you know anyone interested in buying it so it goes to good hands? I remember the $440 price tag back then was all the money I had which is why I have held on to it so long. Ha. Reminds me of riding my old clonker in the 1990s…rigid and slack at the same time.